You are currently browsing the tag archive for the ‘Community-supported agriculture’ tag. I couldn’t be happier to see my friend Kara of Evening Song Farm at the Rutland Farmer’s Market this morning! Kara and Ryan were able to pick tomatoes prior to the storm and of course they were already drying their onions, shallots and garlic in the barn, which thankfully wasn’t damaged. They are maintaining a very positive attitude with the help of such great community support. I was heartened to hear that they are undertaking the task of moving forward with the same veracity to which they attended their crops. For anyone who doesn’t know, Evening Song Farm is a 3 acre farm owned by Kara Fitzgerald and Ryan Wood-Beauchamp in Cuttingsville. They purchased the property just a little over a year ago and have put their heart and soul into turning the land into a community supported agriculture farm. Their farm which bordered the Mill River was forever changed by Irene. The course of the river literally changed and now runs through what was their bountiful farmland. Here is a video where Kara and Ryan show the devastation to their land. If you are inclined to help, please visit their webpage on how to donate to their rebuilding effort. I stopped by the Wallingford Locker this afternoon and picked up some great looking fresh chicken cutlets — and the jasmine rice is the rice cooker now. Can you guess what’s for dinner tonight? S-T-I-R F-R-Y! Dicing and chopping makes me feel like I came from culinary school and the actual cooking part takes but a few minutes. Tim’s not in the house, so even sesame oil and sesame seeds might find their way into this stir fry tonight. By contrast things are growing …slowly….. in the garden, but at least they are not (as of yet) being eaten by any bugs or critters — and I do already have tomatoes on the vines thanks to my awesome oldest son’s biology project. 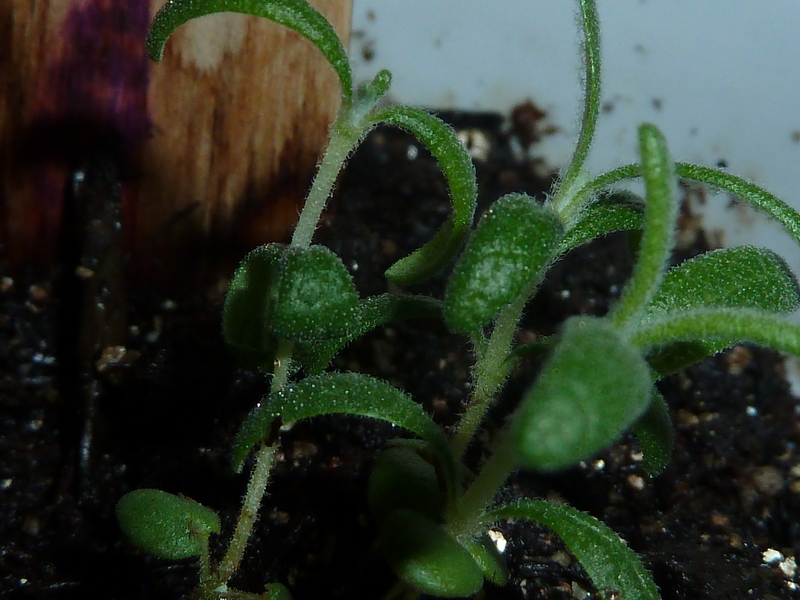 I am however very proudly nursing along some rosemary from seed — which I understand isn’t the easiest thing to grow. (Read: Yay me!) Don’t anyone of you tell me that it’s easy to grow or I will cry. I’m proud of my efforts and I love rosemary so I am one very happy girl. Today was our first CSA pickup! This afternoon, we ran over to Evening Song Farm to chat with Kara and Ryan and Echo (who was behaving himself very nicely with all those potential playmates coming and going) and gathered our first CSA of the season. After spending a nice chunk of time speaking with Evening Song Farm owners, Kara and Ryan for my article that I did on their farm a month or so ago, I feel a connection to them. They are a genuinely nice couple that make you immediately feel at home. 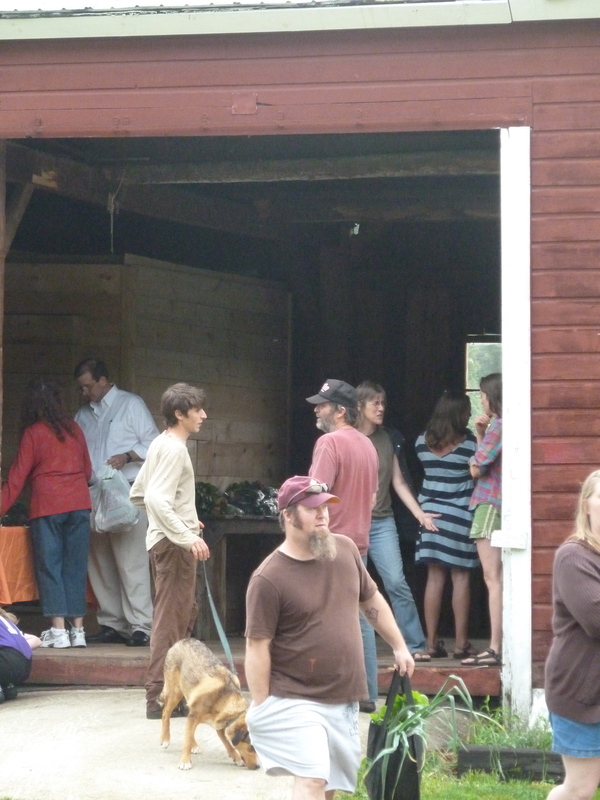 I was so very happy today to see so many people coming and going from the barn that is the CSA pickup location. They are a great addition to the community and I was so looking forward to the first pickup today. Since I grow my own garden, and quite a large one at that, many people questioned my sanity at joining a CSA. Why would I do that? Simple answer, my family and I use more produce that I can produce and those that know us know that we have a lot of company. Since I usually go to the Rutland Farmer’s Market and purchase at least as many items as I am getting in my weekly CSA pickup, why wouldn’t I want to get a discount (yes it’s cheaper than purchasing the same items at the farmer’s market) and have the convenience of being able to pick it all up within five minutes of my own door? To me, these are good reasons, along with the fact that I’m helping a new local business get a leg-up in a less than desirable economy. Another good reason for joining was that my veggies are merely little seedlings right now and I’m certainly not growing a lot of what they have to choose from at the farm. 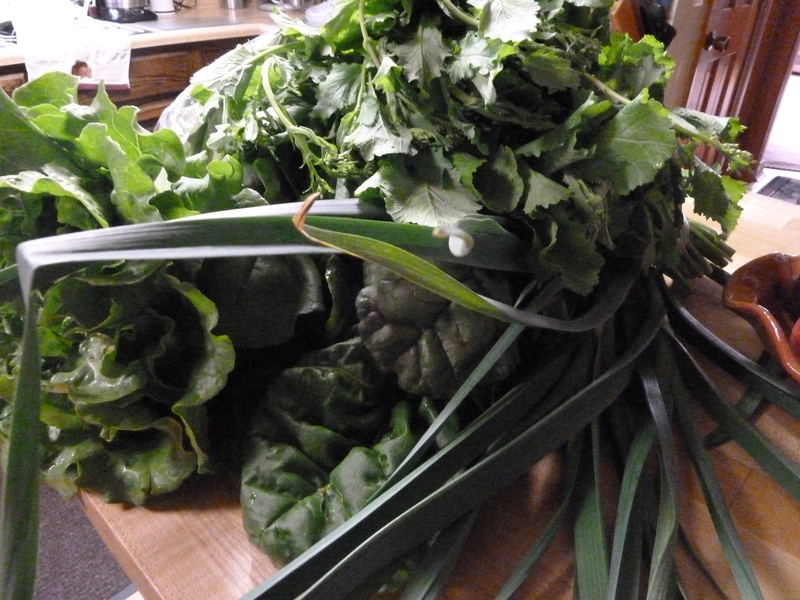 We chose broccoli rabe, lettuce, baby lettuce, pea shoots, baby bok choy and these beautiful long and amazingly delicious garlic scallions that are at least two feet long. 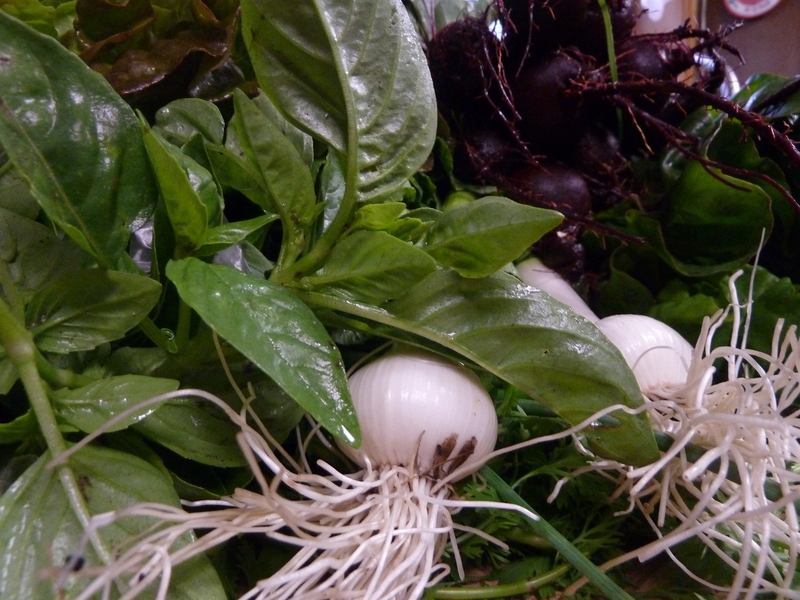 Thanks so much to Kara, Ryan and Echo for some beautiful, fresh and delicious local veggies. Needless to say, tonight’s dinner was angel hair pasta with sauteed broccoli rabe, garlic scallions, olive oil and crushed red pepper. It was delicious!